What does a gobby, self-important minister have to do to get fired from the Coalition front bench? Vince Cable was already in the doghouse for telling two undercover Daily Telegraph reporters – Holly Watt and Laura Roberts, who had posed as giggly constituents - that if, pressed he could resign and bring down the Tory-LibDem government. Cable should have been sacked when it was later revealed he’d also boasted he was “at war” with the Rupert Murdoch empire. His mind appeared already made up ahead of receiving the Ofcom watch dog’s advice on the media mogul’s plan to take control of BSkyB. Party leaders David Cameron and Nick Clegg have been forced to grit their teeth and allow Cable to remain in his post as business secretary though relinquishing his role in the future of the BSkyB bid. Hardly anyone comes out of this mess with credit - least of all Cable. 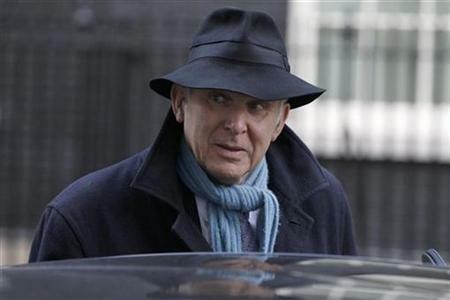 Vince Cable had a good financial crisis particularly while scoring points against the Labour government of the day over its handling of the Northern Rock collapse. He earned a reputation for financial acumen in the public mind but this was never echoed in the City of London where he was notorious for his policy U-turns. If stuck for a crowd pleaser, he would lash out at the banks. Cable’s popularity owed much to his ready wit and that he didn’t fit the stereotype of today’s career politician – he is well into his sixties, has had a proper job before becoming an MP, and he isn’t in the same well-heeled, well turned out mould that produced Cameron and Clegg. I doubt if Cable will ever be held in the same esteem again. He has had to excise the part of him attracted to the 'true' LibDem cause in exchange for a flirtation with high office that has come rapidly to grief. I don’t castigate Watt and Roberts. They exploited a middle-aged man’s weakness to female flattery to reveal that LibDem mendacity went deeper than breaking its pledge to fight higher university tuition fees. From here on in it gets murkier. There is the Daily Telegraph who took the high moral ground when MPs wanted to redact embarrassing information about their expenses. Yet the newspaper wasn’t prepared to tell the whole story about Cable’s gaffe, because it too is anti-Murdoch. The BBC is also opposed to Murdoch’s takeover but it supported Peston’s disclosure. Although Cable has lost some of his power to damage the government, its fragility has been exposed. With David Laws gone, the Coalition couldn’t afford to lose another high-ranking LibDem from the Cabinet fearing it would antagonise backbenchers. The Labour opposition has been given useful ammunition to depict the Coalition as incompetent. But it had better tread carefully when Ofcom is expected to advise that the BSkyB deal be investigated by the Competition Commission. In the past Tony Blair and Gordon Brown have been too eager to get into bed with Murdoch, owner of the The Times and The Sun newspapers. A clear winner, however, is the BBC’s business editor Robert Peston. He revealed that the Daily Telegraph had lied when it said it had published Cable’s full transcript although in fact it had censored the BSkyB references. The whistleblower who gave Peston a scoop as good as any in his distinguished career – from whatever motive – was acting in the interests of open government. Yes GC, says Jaffa. Your analysis is excellent. Remember who said "he has gone fom Stalin to Mr Bean"? Who's sorry now Vince Cabal, sorry Cable? However, this is serious stuff. A whole department of 70 people had to be reallocated to deal with this issue once Cable had been removed from it. And yet GC I believe there is a psychological dimension to all this. All these LibDem MPs have been 'entrapped', because they were vulnerable to their consciences and their ideals. In the modern world it is practically impossible not to fall foul of controversy. Most the coalition are relatively young people, and inexperienced in holding cabinet positions, and nobody is that good that they do not have at least some unguarded moments, especially when you never know when what one says is being recorded, deliberately or inadvertently, and every word and or gesture is analysed to see if it contains contradictions. Let alone being interviewed by journalists posing as something/somebody else. Some questions for you GC. Who was guarding the backs of Cameron and Clegg at their press conference, when they were covering for Cable before the real story broke? Where was Andy Coulson, an ex Murdoch empire man? Is their a tory right wing agenda here, eg the 1922 committe to put presure on moving the coalition more to the Right and so undermine it. Unless he was being diplomatic Peston does not agree with you about the whistleblower. He maintains that the Telegraph got the info to him one way or the other. At that time Cameron and Clegg were trying to be open with the public in their press conference. It was the Telegraph people who played games, from the secret recordings onwards. All that changing of gov depts because of Vince's so called indiscretion, when his intuition was correct all along. He did not have to go to war with the Murdoch empire. Part of the empire fell on its own sword; ie the closing of The News of the World.